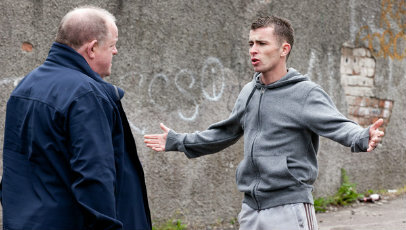 Robbie (Paul Brannigan), an untoward young man who, by the skin of his teeth, escapes a prison sentence in favour of a community service ruling. Vowing to do right by – and make a better future for – his girlfriend Leonie (Siobhan Reilly) and their unborn child, Robbie surrenders himself to what could be his last lifeline. With the aid of fatherly-figure and community service supervisor Harry (John Henshaw), he discovers a talent that could bring himself – and fellow wrongdoers Albert (Gary Maitland), Rhino (William Ruane) and Mo (Jasmin Riggins) – the new lease of life they all yearn for. Taking a welcome detour from his more usual, heavyweight outings, The Angels’ Share represents a milder, more humanistic and idealistic Ken Loach who, with the aid of regular screenwriter Paul Laverty, has matured with age and refined his ability to gently interweave social realist elements – unemployment, poverty and crime all play a part here. However, that’s not to say that The Angels’ Share is overly imperceptible as Laverty roots Robbie’s emotional journey in a sense of authenticity that rings true. As has become synonymous with Loach, the central cast that carry The Angels’ Share are an accumulation of relative unknowns – and it is Brannigan who is the film’s stand-out performer. Much like Martin Compston’s Liam in Sweet Sixteen, Brannigan imbues the on-edge, easily provoked Robbie with a convivial undercurrent that makes his maturation (much like that of the rare whiskey that becomes their purpose) all the more honest and engaging. Each of the cast, however, are rewarded their own opportunities to shine not only by Laverty’s honed, yet comically-attuned writing style, but also through Robbie Ryan’s character-centric cinematography and Loach’s understated, unbiased direction. In spite of Loach, Laverty and the entire cast’s best efforts, The Angels’ Share become a little insubstantial in its second act and the tonal shifts and musical interlude choices disturb the steady equilibrium all-too haphazardly. The film may also be a little too trite and hypothetical for some people to handle – particularly the way in which some elements can be easily picked apart – but there’s no denying the boundless charm, wit and cool air that envelops this suitably amiable tale. Time will tell if age has served Loach well, but The Angels’ Share certainly marks an interesting shift in his focus – one that leaves a familiar, yet piercing taste.